School Terrace, Reading, RG1 3LS. Children Only Session: Wednesday Afternoon. A raised bed with vegatables grown by the children. New Town Primary School had an area of playground that had been run as a school garden in the past but in recent years had become disused and overgrown. Katie – a new teacher to the school - spotted the potential for the space and got in touch with Food4families. We helped to tidy up the garden by clearing brambles and weeds, cleaning out the pond and constructing two raised beds to grow vegetables in. During the spring and summer term, garden tutor Naomi ran weekly sessions for the two Year 5 classes. The children planted quick growing crops so that we could try them before the end of the summer term. In the raised beds we grew salad leaves, rocket, radishes, carrots, spring onions and marigolds and in the last session of term made these into a very tasty salad for everyone to try. It got a big thumbs up from the children who were really keen to try produce they had grown themselves! Children also learnt about beneficial insects and natural pest control in the garden and we hope to plant more for wildlife and pollinators this year and see if this increases biodiversity on the site. The school applied for the Dorothy Morley Conservation Award 2018 and won a grant to put towards conservation and gardening work at the school. We hope to start working towards the RHS Schools Challenge this year too. We have also identified other areas in the playground which we could green up such as the Reception playground and the Nursery playground to make these areas more exciting for the children who use them. A selection of herbs and leaves that can go in to a salad. A prepared amount of leaves and vegetables for a salad. 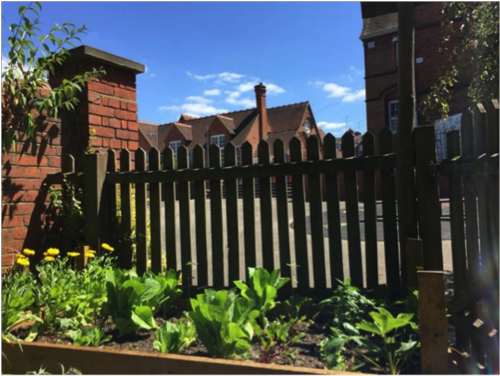 If you’d like some help setting up a school garden at your school or would like a garden tutor to come along to run some fruit and veg growing sessions, please contact us.